We all love spring as the weather begins to change a bit. Flowers begin blooming, Birds singing, New life seems to be popping up everywhere you look. Unfortunately, that is also the case with pests. Because many insects are dormant in the cold months of winter, spring is when many homeowners realize that they may have a problem with pest control. Ants are some of the first bugs to reappear as temperatures rise. Sugar ants, carpenter ants, large black ants, winged ants and little black ants are all commonly spotted by consumers. 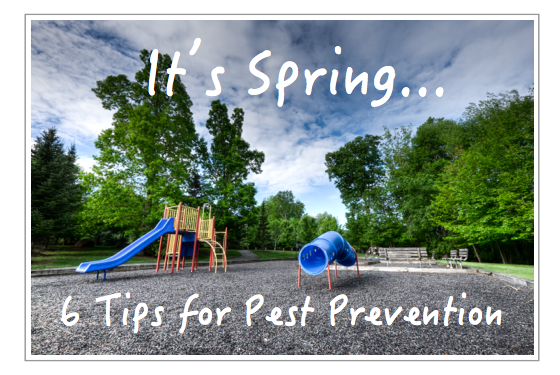 Other springtime pests include bees, wasps, spiders, crickets, mites and beetles. Fortunately, by following the preventive pest control methods outlined below, you can prevent springtime insect populations from getting out of control. Pest Prevention and Control go hand-in-hand; it’s much easier to prevent a pest infestation than it is to battle a full-blown insect invasion. Tour your property looking for wasp nest and bee hives. Don’t forget to look in the eaves of your home, trees, and even your attic. Rafters and vents are favorite nesting grounds for these stinging insects. If you do discover a nest, be sure to give us a call so we can help take care of the problem. Remember any call backs between regular services are completely FREE. Removing these unwanted inhabitants is just too dangerous to do on your own. Don’t let go of that Sherlock Holmes approach to preventive pest control just yet. Now it’s time to scour your home’s exterior, looking for cracks and holes in foundation or openings around windows. Problems with Ants can usually be traced to tiny fissures around windows, cracks in walls, and improperly sealed doors. Remember, insects must enter your home before they can pose a real pest control problem. Seal any cracks you find. 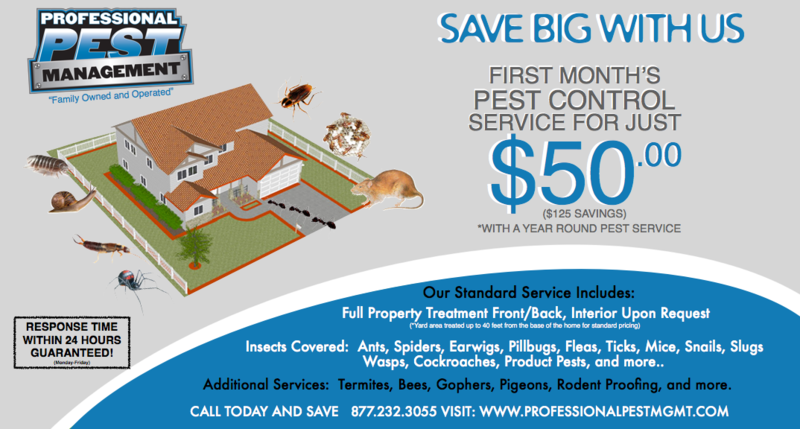 By eliminating any openings in your home’s periphery, you’re taking the first step in pest control. Ants are especially diligent about locating new entry points, so you may need to conduct this tour several times a year, resealing as you go. Think of plants as the bridges insects cross to enter your abode. If grass is growing right up against your foundation, insects are more likely to be present, as well. In addition to proximity, poorly placed plants can exacerbate pest problems by weakening the structural integrity of your home’s exterior. Many residential pests are fully capable of surviving in nature as well as inside your home. Maintaining a clear, plant-free zone around the base of your home is an excellent habit for pest prevention and control. Look for Trees that overhang or are closer than 4 feet off the roof line of your home. These can serve as freeways for rodents who may find shelter in your attic space and may eventually make there way into your home. Be sure to trim the trees back and/or remove them when necessary. Rodents can and will cost you thousands of dollars to get rid of. For pests, an unkempt pantry is like a buffet line. If food packages are not completely sealed, pests will be happy to eat their fill. And even random crumbs can be enough to create the need for pest control. Ants are especially vigilant about food left in the open; sugar ants will discover a few spare grains of sugar in mere minutes. Therefore, wipe down your counters, clean out your cabinets and keep a clean floor. All of these cleaning methods will help you well in your quest to ensure ants don’t find their way into your home this spring and summer. Really, any area that commonly holds food will act as a magnet for pests. The trash can is a common weak point in pest prevention and control. As you run through your springtime pest control checklist, take a good look at your trash cans to ensure they have tight-fitting lids. Also, lining bins with garbage bags is a good routine for pest prevention and control; the bag acts as an extra layer of defense. Firewood piles are attractive to pests such as termites and rodents. Indeed, to many insects, a stack of firewood acts as both shelter and food supply. To keep pulp-eating pests out of your home’s woodwork, move your firewood pile away from any buildings and store it off the ground, if possible.